Product prices and availability are accurate as of 2019-04-23 00:36:34 BST and are subject to change. Any price and availability information displayed on http://www.amazon.co.uk/ at the time of purchase will apply to the purchase of this product. The DoubleWood Balvenie is a single malt, aged 12 years, which gains its distinctive character after being aged in two barrels. During the ripening period it is transferred from a traditional oak barrel to a European sherry oak barrel. The most artisanal and authentic of single malts. 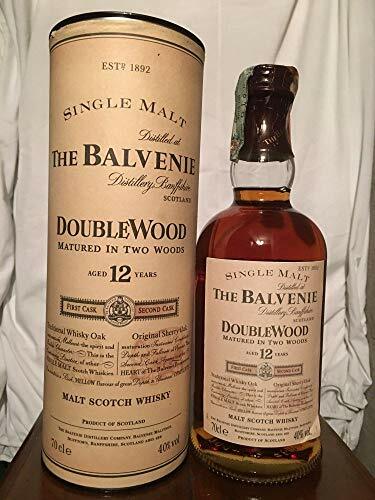 The Balvenie is different from all other malts thanks to a unique combination of human skills and natural alchemy. It is certainly the most artisan single malt still on the market. Let's see why: What makes the Balvenie unique Cultivation of the barley Traditional malt in the distillery Ramai tapes for the maintenance of the stills Coopers for the manufacture and care of all barrels The most experienced master distiller in the industry: David Stewart Barley and maltage A farm, Balvenie Mains, covering more than 300 hectares, which supplies part of the barley used, extends to the distillery. Barley is malted in the only malting floor still existing in the Highlands. Distillation The stills are taken care of by the same master coppersmith. Barrels Balvenie's master coopers continue to produce all the barrels in which single malt is aged. Alcohol content: 40% vol. Bottle in excellent condition.